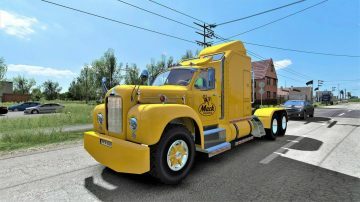 It is bought in a motor show “mTG” (Replaces salon “Peterbilt”). Registered in the gallery and in the orders of companies. Added the missing files and, if possible, corrected the detected errors. Majic Old truck works great. Will see if I can find time create some gold style skins for it. If I wanted to be picky and am not these being picky, but probably showing my age. The first time indicators were added, they strapped them on with a great radiator clamp on the side of the steering column. The next model was similar but they added a globe inside the base that worked whenever the indicator arm went in either direction. Then a single globe on the dash. Great JOB. Many thanks for your work. 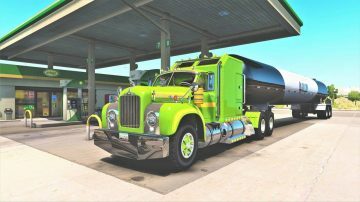 Would you change the fuel tank size please 119 gallons is not a great content in a truck especially when you can put 2 extra big tanks on? Should be in configuration of something like 278 and 378 depending if your using US or UK gallons. As the main SCS file wont let me edit it myself. 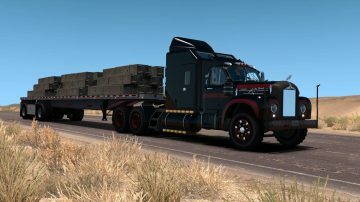 In order to increase the fuel on any truck in game, you have to edit the chassis file for the chassis you want to use. The chassis files are in the zipped file of the mod. Unzip it then look in “mod name/def/vehicle/truck/truck name/chassis and use notepad to open the chassis file and look for this “tank_size:” increase it too much and your old truck will run out of def fluid. To which you will need to add this right after the tank size “adblue_tank_size: 200” The 200 will let you run 3000 liters of fuel which is 793 gallons. If you add more then 3000 liters of fuel you must increase the adblue. If you don’t increase the adblue you will run out of it and have to refuel, even if your guage still shows you have fuel left. BigM, I know what you’re saying my issue is Part 1 I can’t open it, which is where the CHASIS are. 7Zip and winrar can’t open file, the other 2 parts no problem. Tank Configurations, well over here duel Step tanks roughly 120 gallons, Step Tanks and dual long tanks 278 Gallons and Dual round tanks like you can put on here 378 Gallons. Was not aiming to put some ridiculous size on just whats right. So can you get to the chassis.